Monte Forato had caught my eye while we were driving south through Italy and we’d immediately put it on our to-do list. There was too much snow on the mountain in February though, so we had saved it for our trip north. 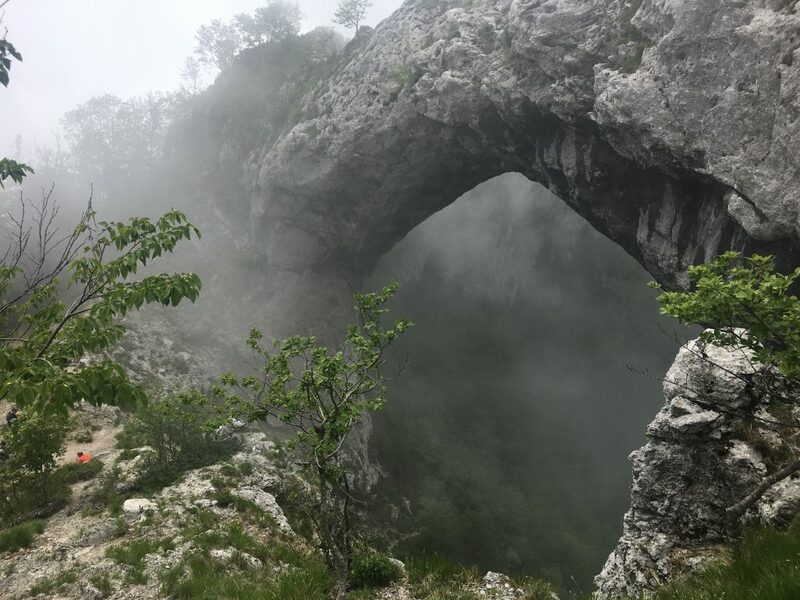 The mountain is distinctive because of the large limestone arch that creates a hole in the summit of the mountain. 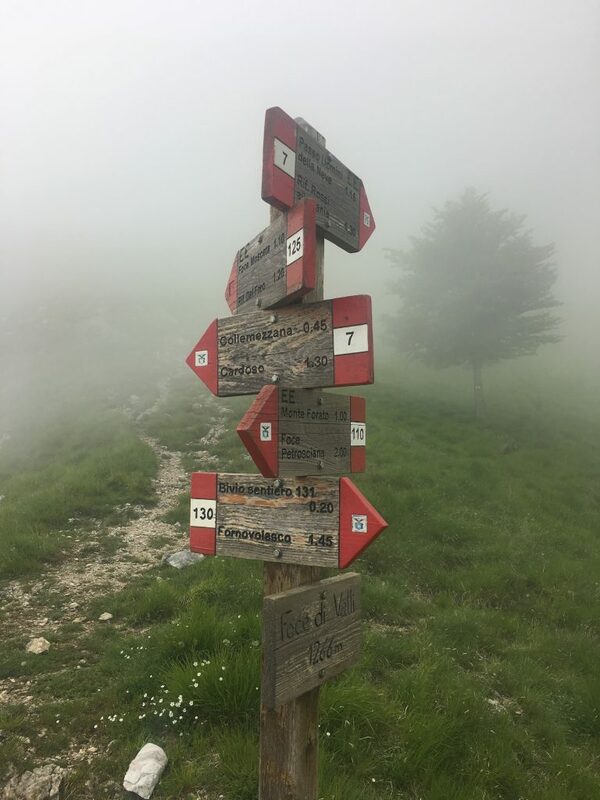 It’s not the highest mountain in the Apuan Alps, but because of it’s quirky summit it seems to be the most popular. The night before we climbed the mountain we stayed in a free sosta (including electricity) in Bagni di Lucca. 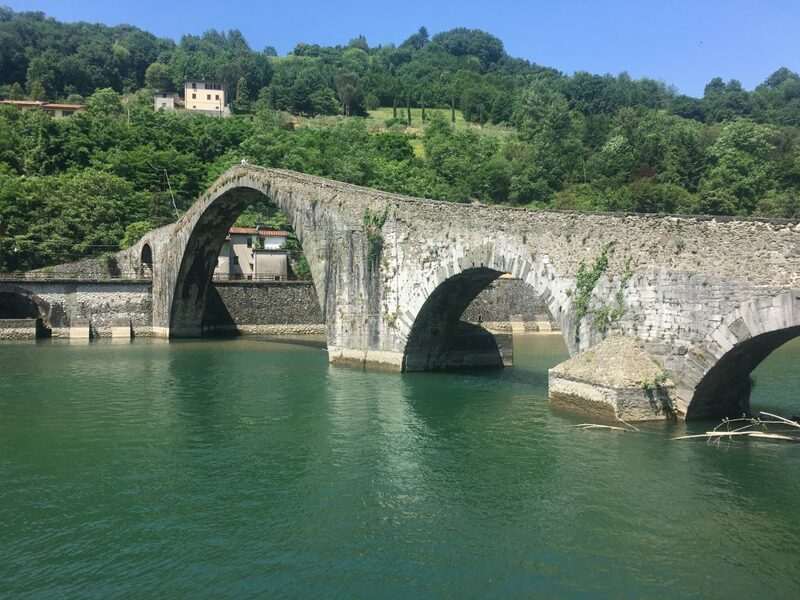 Bagni di Lucca is a collection of hamlets spread through the valley and the sosta sits on the banks of the river between two attractive and very different bridges. Ponte delle Catena – an early suspension bridge (1840) inspired by the Hammersmith Bridge which connects the sosta to the hamlet of Fornoli. 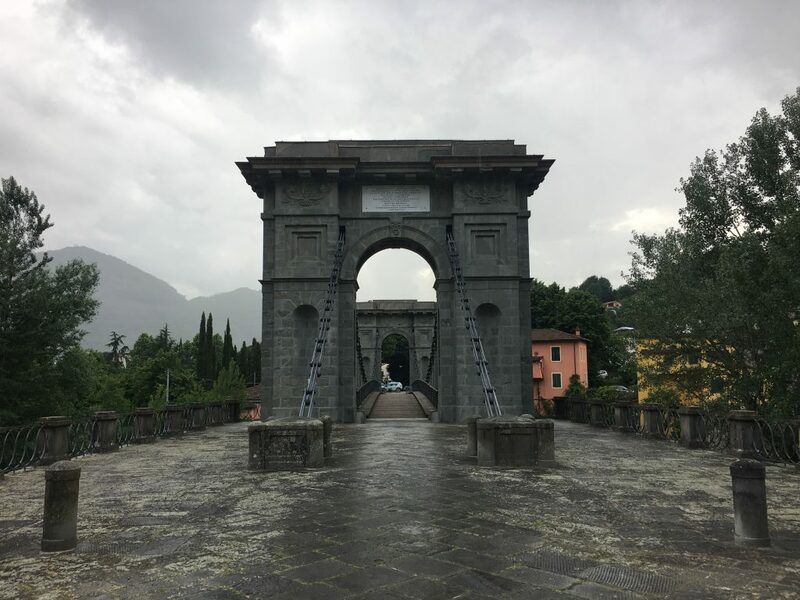 We left Bagni di Lucca to head up to Fornovolasco, initially we had some issues due to a road closure in Gallicano, but we worked around that to find the winding narrow road through the gorge. 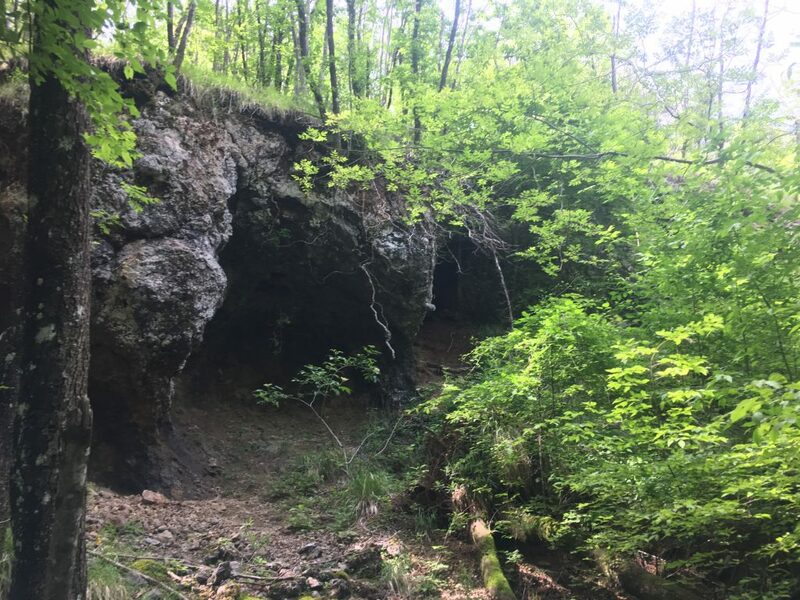 We held our breath through the narrow spaces and ducked when we encountered rocky overhangs but most of all enjoyed the limestone scenery. There is parking on two levels near the entrance to the village and we manoeuvred ourselves into the uppermost parking area – we tried this a couple of ways eventually reversing up the road and then pulling forwards into the car park. Apologies to the village for the scrape our chassis made in the tarmac where we tried to reverse into the carpark – it was a bit much for our overhang. We walked through the village to find the start of the walk near the bridge. The walk was well signposted with the usual red and white stripes of the CAI (Club Alpino Italiano). We chose the most direct route up (12) that took us to the famous hole in the mountain. There are meant to be fabulous views from here, but we couldn’t see far and instead had the atmospheric sight of fog creeping through the hole. There were plenty of other walkers, it was one of the busiest summits we had seen in a while, but oddly we didn’t see anyone else on the way up or on the way back down. The hole at the top of Monte Forato; the arch spans 32 meters and is 25 meters high, the arch’s rock is about 8 meters wide and 12 meters high.After exploring the twin summits of Monte Forato and it’s spectacular arch, (which bore an uncanny resemblance to the arch of the Ponte della Maddalena) we meandered onwards and upwards along the ridge to the next summit of Foce di Valli, the significant drop offs were handily disguised by the cloud which reduced the fear factor to practically zero. Finally we followed path 130 down through a flower studded meadow to the forest and finally back to Fornovolasco. 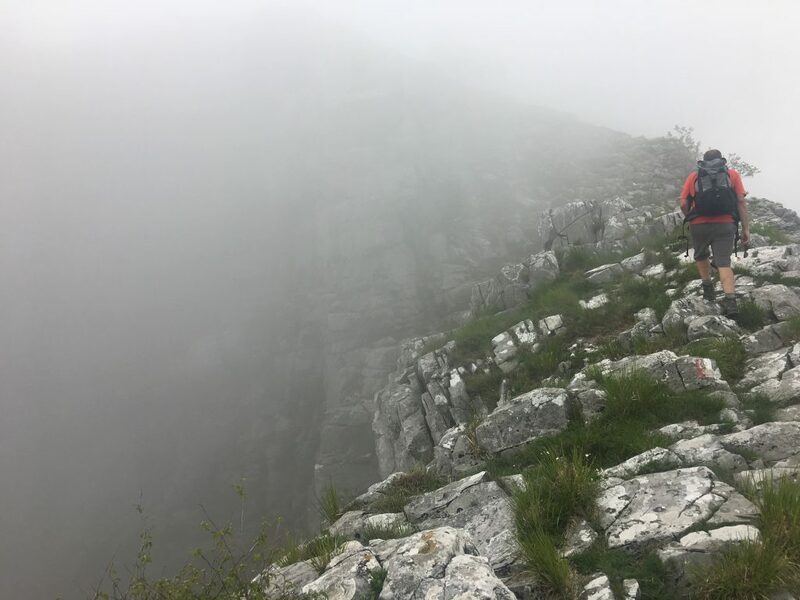 The summits were low compared to some of the places we had been walking recently (Foce di Valli was the highest at 1266m), but the walk had started relatively low too so we’d had a good workout and seen spectacular geology amongst the fog. 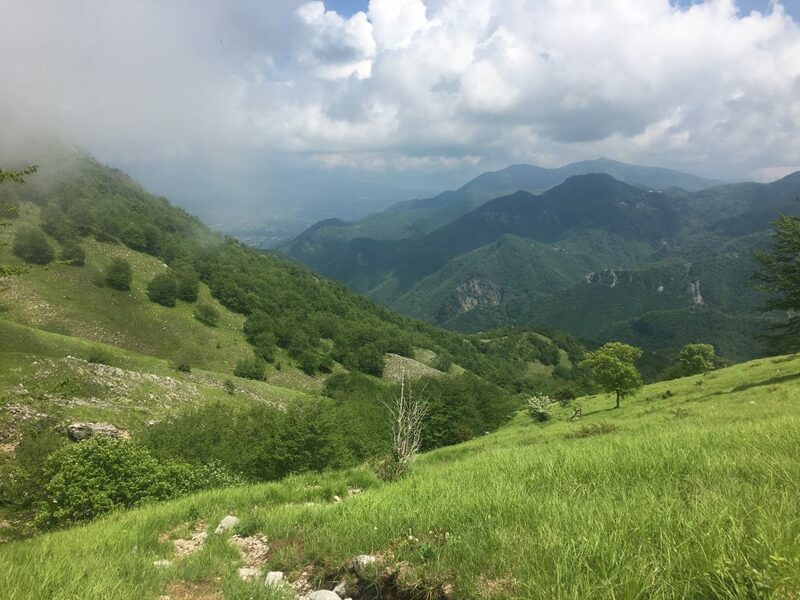 The low altitude had taken it’s toll though because it was HOT, we both decided that we could not do any more walks in 28 degrees (pathetic aren’t we) and although we’d like to see more of the Apuan Alps it would have to wait for another, cooler, time. Instead we would head for the actual alps where we could escape the heat. For the evening we went to another free sosta at Castelnuovo di Garfagnana where we planned our route back to reasonable temperatures.